The harder a baseball pitcher can throw the ball, the more difficult it is for batters to hit. You can incorporate both baseball related and non-baseball-related exercises into your workouts to increase your throwing velocity. A combination of strength and flexibility training can get your fast pitch moving faster while avoiding injury. Long toss is one of the most effective and popular arm strengthening exercises. According to Tony Rasmus, a baseball coach in Russell County, Alabama, most kids in a long toss program see increases in velocity of 4 to 5 mph. Long toss is a throwing program in which players and pitchers try to extend the distance they can throw the ball. Players first throw as if in a regular warmup and gradually move back until they are throwing the ball as far as they can to one another. The goal is to use normal mechanics. In time, many players can throw the ball over 300 feet. Resistance band exercises improve arm strength as well as flexibility to prevent injuries. Attach a resistance band to a fence or pole, and grab it behind you with your throwing arm bent at a 90-degree angle, as if you are preparing to deliver a pitch. Open and extend the arm before returning to the starting position, and repeat for at least 10 repetitions and three sets. Similarly, arm swing drills work your shoulders and simulate the end of the pitching motion. Stand to the side of the band, and grab it with your hand while keeping your elbow bent to about 90 degrees. Pull the band across your body until your arm is right across your mid-chest, and return to the starting position. Repeat for at least 10 repetitions and three sets. Weightlifting for pitchers should focus on high repetitions with light to moderate weight mixed with stretching exercises to promote flexibility. The weight used should be about 50 to 60 percent of the maximum weight that you can lift. Focus on exercises like bench presses, rows, lat pulls, pushups, triceps pulldowns, dumbbell flys and wrist curls or forearm rolls. These exercises focus on your chest, back, triceps and forearm muscles, which are the muscles most involved in throwing. The strength and stability of your lower bodies has an influence on your throwing velocity. Perform exercises like squats, lunges, deadlifts and calf raises to strengthen your lower body. These exercises focus on your quadriceps, hamstrings and calves. 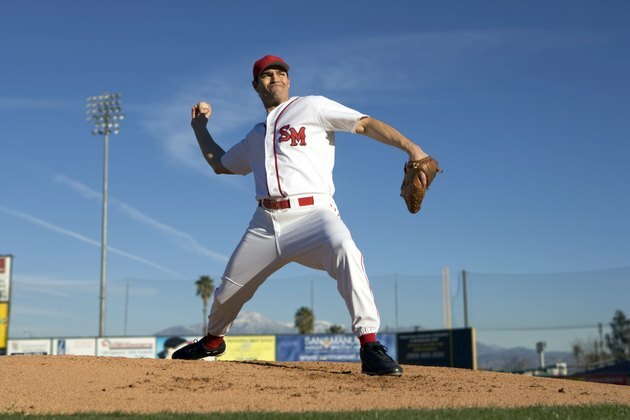 A pitching motion requires your legs to drive, push off and extend to the plate, so strength in your legs can help the delivery and, in turn, the velocity.